Sofia/Brussels, 19 April 2018 – Climate change activists demonstrating outside a meeting of EU energy ministers in the Bulgarian capital Sofia urged European governments to stop restricting the rights of people to produce and share their own renewable energy. The ministers were meeting to discuss the final stages of talks with the European Parliament and the European Commission on the EU’s Renewable Energy Directive. 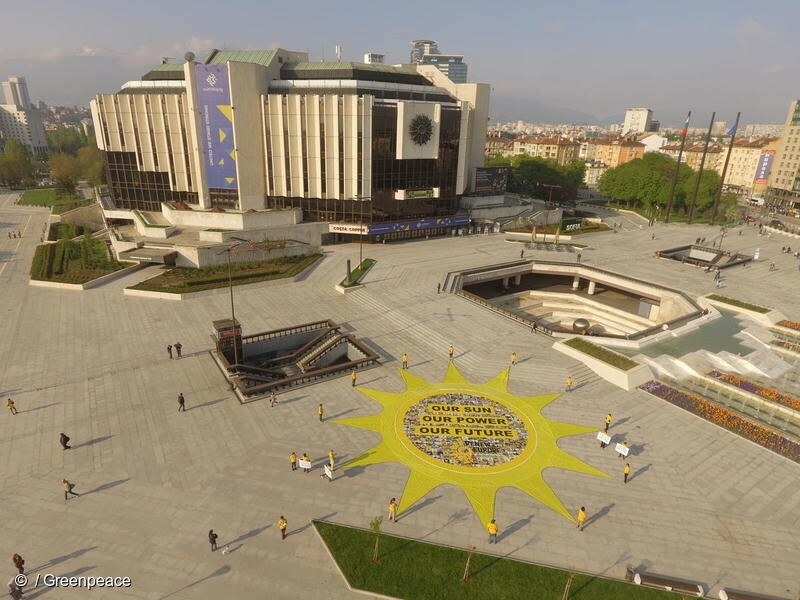 The activists unfurled a giant sun-shaped banner outside the Bulgarian National Palace of Culture, where the meeting was taking place, reading “Our Sun. Our Power. Our Future.” The 25 activists, from nine countries , delivered messages from people across Europe calling on ministers to power the transition away from fossil fuel and nuclear energy production to clean, renewable energy. The banner was covered with hundreds of selfies sent in by people all over Europe. The final negotiating sessions between EU governments, the European Parliament and the European Commission will be held on 17 and 29 May. One of the main points of contention is the rights of individuals, cooperatives and cities to produce and sell their own renewable energy. The position agreed among EU energy ministers could seriously penalise people generating their own energy. For example it would allow national governments to impose punitive fees and to heavily restrict how and where people can produce and share energy, with additional burdens on those who do not own their own roof, such as tenants. Governments could also burden prosumers with the same registration requirements as large power companies, if they feed any amount of electricity into the grid. Another point under discussion is what share of Europe’s energy should come from renewables by 2030. The Commission originally proposed a target of at least 27 per cent, but seems open to at least 34 per cent. Most governments want to stick to a minimum 27 per cent target, but some countries, such as Sweden, have backed a minimum 35 per cent target. The Parliament is calling for a minimum 35 per cent target. A 2016 report by CE Delft showed that, with the right support, half of all EU citizens could produce their own electricity from renewables by 2050, meeting nearly half of the EU’s electricity demand. Power companies would provide the remainder of Europe’s renewable electricity. ** First high-res photos available at https://media.greenpeace.org/collection/27MZIFJXTF2WL? Bulgaria, Austria, Croatia, Germany, Hungary, the Netherlands, Poland, Romania and Slovakia.